Since the Apple officially announced the release of Mac OS X 10.10 Yosemite on 17th Oct 2014, a lot of Mac users had updated to this new OS X which has good performance and stability the same as Mavericks, and also a lot of great hidden tips there. But actually many Mac users met problems when upgrade to Yosemite, an instance in point is the Mac Blu-ray ripping software. You will get nothing but disappointment if you try to rip Blu-ray on Yosemite. What if you want to transfer DVD files to your computer hard drive on Yosemite? Is there a tool that keeps pace with Mac's latest OS X 10.10 Yosemite and can also rip Blu-ray movies with ease? The answer is surely yes. EaseFab Blu-ray Ripper for Mac is the one that will well fulfill your needs. Constantly updated to fit with the latest technology, EaseFab Blu-ray Ripper for Mac is the most ideal choice to rip Blu-ray on Mac OS X Yosemite. 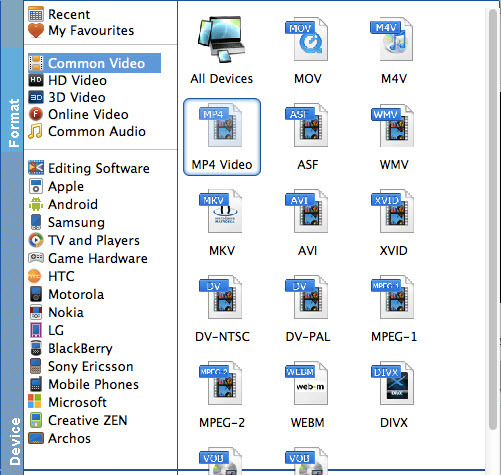 It lets you rip and convert Blu-ray movies to virtually any popular video formats like MOV, MP4, M4V and more. Compared to other Mac Yosemite Blu-ray ripping tools, EaseFab Blu-ray Ripper for Mac supports more output choices. Apart from that, it also provides optimized presets for various mobile devices like iPhone, iPad, iPod, Kindle Fire, Android smart phones, PSP, Xbox and more. What's more, EaseFab Blu-ray Ripper for Mac OS X Yosemite also offers enough freedom for all movie lovers like you to back up your favorite Blu-ray and DVD movies (See: Top 3 Ways for Lossless Blu-ray Rip and Backup ) in a personalized way. Three different copy modes: Main movie, Full Disc Copy and Customized movies are provided to let you copy the exact movie part you want. By the way, this Yosemite Blu-ray Ripper also supports Mac OS X 10.9, 10.8, 10.7, 10.6, 10.5. That's it, download to try it now. 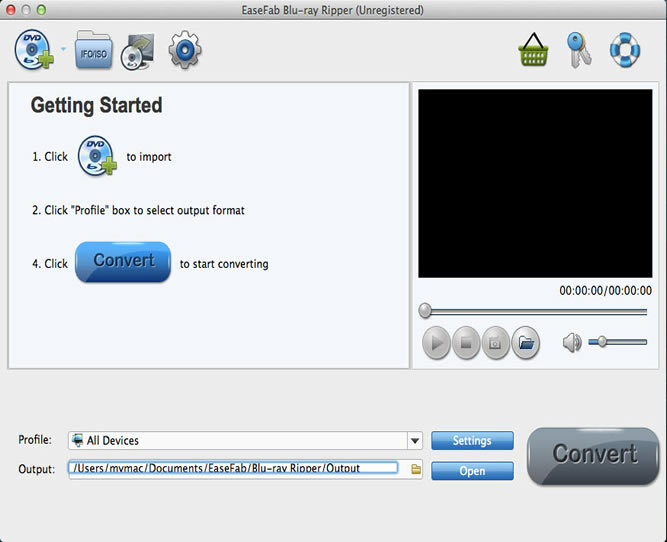 EaseFab Blu-ray Ripper for Mac enjoys a concise and clean interface, which makes it extremely simple to handle. Here are the steps to rip Blu-ray on Mac OS X Yosemite. Now just download the software, install it on your Mac and follow the steps below to start the joyful Blu-ray ripping(A BD drive is necessary) journey. Tips: A Blu-ray or DVD may contain many titles more than the main movie, such as the trailers or commercials. By default, EaseFab Blu-ray Ripper for Yosemite choose the longest title which is usually contains the main movie. And this helps ripping without converting unnecessary titles. And double-click one of the titles, and you can preview the movie in the Preview window on the right. After loading the files, now you need to choose an output format. If you just want to play the Blu-ray files on Mac with QuickTime or iTunes player, MOV or M4V is the recommended output format. If you want to convert Blu-ray to play on iPhone, iPad or some other mobile devices, just specify the corresponding optimized presets as the output format, since these output parameters has been adjusted to fit seamlessly your devices. When all settings are done, now the only thing you need to do is click the Convert button to begin ripping Blu-ray immediately. The conversion will finish in a few minutes. After the conversion is complete, you can enjoy the Blu-ray movies as you like on Mac without any hassles.